Baumer is extending its portfolio with the DST55R range of strain sensors with long-term seal, offering a cost-effective solution for measuring in tough outdoor conditions. The sensors are a significant improvement on the standard models on the market due to their category C5-M corrosion-resistant materials, IP69K protection rated seal and the Baumer proTect+ impermeability concept as well as their digital CANopen interface, and extended operating temperature range of -40 to +85°C. 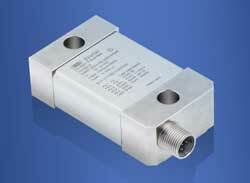 They are particularly suitable for industrial applications in the outdoor environment such as mobile automation.